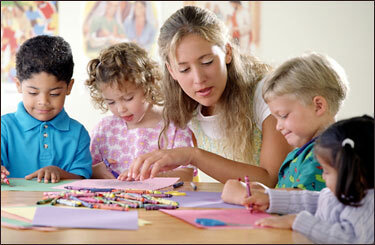 The staff at Creative Beginnings is experienced, well-trained and educated in the field of early childhood education. They consistently provide a fun, learning environment for all ages by planning and implementing developmentally appropriate activities for the children. We believe that the quality of care is only as strong as the quality of the teaching staff. We strive to find staff who have strong teaching abilities, support the needs of busy families and demonstrate a passion for working with young children. More than half of our staff have been in the field of early childhood for more than 10 years. All staff are certified by the Division of Child Development and Early Education as a teacher or lead teacher. Most of our staff have an Associates Degree in Early Childhood, while some have a Bachelor's Degree in Early Childhood or a related field and several more are currently pursuing their degree. All staff are encouraged to increase their knowledge of child development by attending workshops, taking courses and participating in conferences. Creative Beginnings admits children of any race, color, national and ethnic origin, regardless of disability, or of parents' marital status, sexual orientation or political beliefs. We welcome applications from all interested families. Families are encouraged to schedule a tour of the center before enrolling their child. When enrollment is at its maximum, all interested families will be placed on our waiting list and will be offered the next available opening. All waiting list applicants are served in the order they are placed on the list. To request a slot for your child or place them on our waiting list, either apply in person or complete the online application form on this site, print, scan, and email it back to us at cb5star@bellsouth.net and we will contact you.